Home›Blog›What is the difference between the wind driven mist sprayer and the pulse mist sprayer? What is the difference between the wind driven mist sprayer and the pulse mist sprayer? When Mist sprayerer works, the high-temperature and high-pressure airflow generated by the pulse engine (60 explosions per second) is ejected from the nozzle outlet at high speed. When the valve is opened, the pressure in the cartridge chamber (which is inflated 60 times per second by the engine) is pushed to the explosive tube and mixed with the high-temperature and high-speed airflow. Within 0 seconds, the explosive particles are smashed into micron particles and discharged into the air to cool and form a mist (smoke) which sprayers out at high speed from the nozzle and diffuses rapidly. When the controlled object touches the mist or smoke, it plays a role of prevention or treatment. 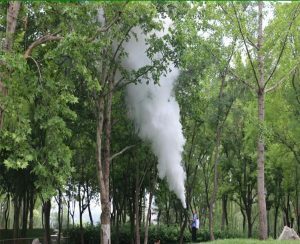 Mist sprayer is widely used in greenhouses, agriculture, forestry, orchards, grasslands, urban environmental protection, open-air crop fertilization and disinfection and sterilization. Such as greenhouses and fruit trees. Corn, cotton, rice, wheat, tea, citrus and other crops insecticidal, sterilization, can be used for forest tree insecticidal, quick effect, good effect, forest insecticidal tools of choice. It can also be used for sanitation, epidemic prevention and disinfection, such as urban underground, garbage dumps, toilets, warehouses, stations, docks, airports, and other disinfection, sterilization.